I am hardly “mom of the year” over here. Entertaining my children sends me into an anxiety stricken state, if I am being honest. I’m working on it. 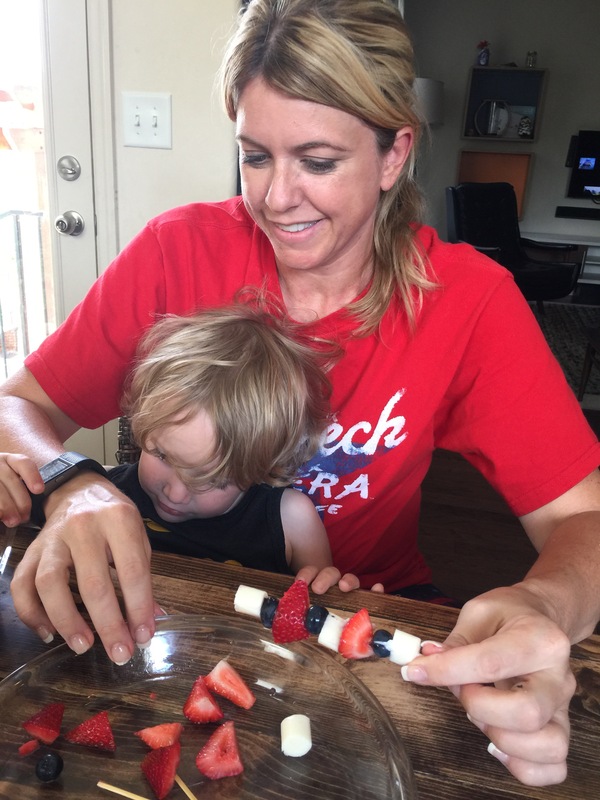 One thing I found that I can get through pretty well with my kids is cooking. I try to keep the recipes very simple and have the ingredients and equipment on the counter before we begin. Kids get bored very easily and if they have to wait for you to get everything out, the project will go downhill fast. 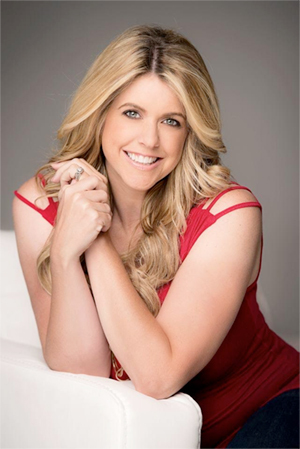 Do yourself and your kids a favor and be organized before getting them involved. 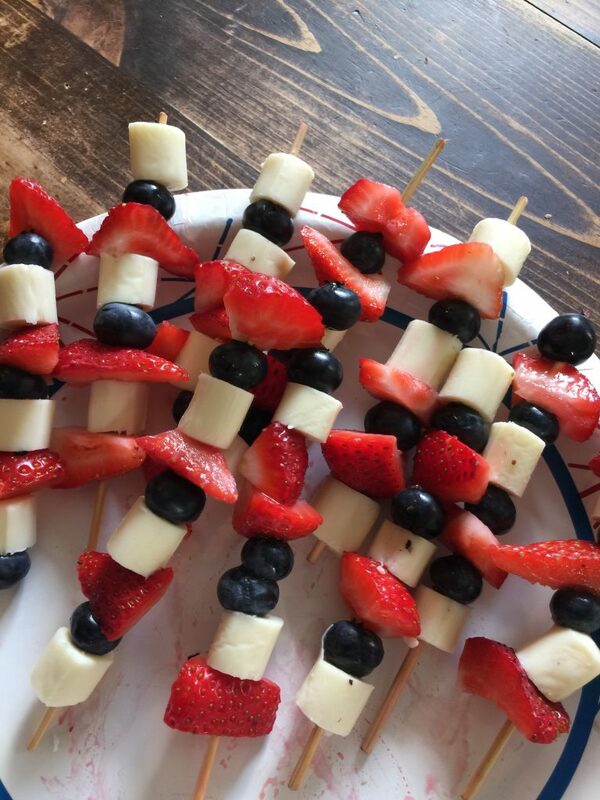 We originally made these kabobs at the Discovery Center the day before Independence Day and the kids went crazy over them! 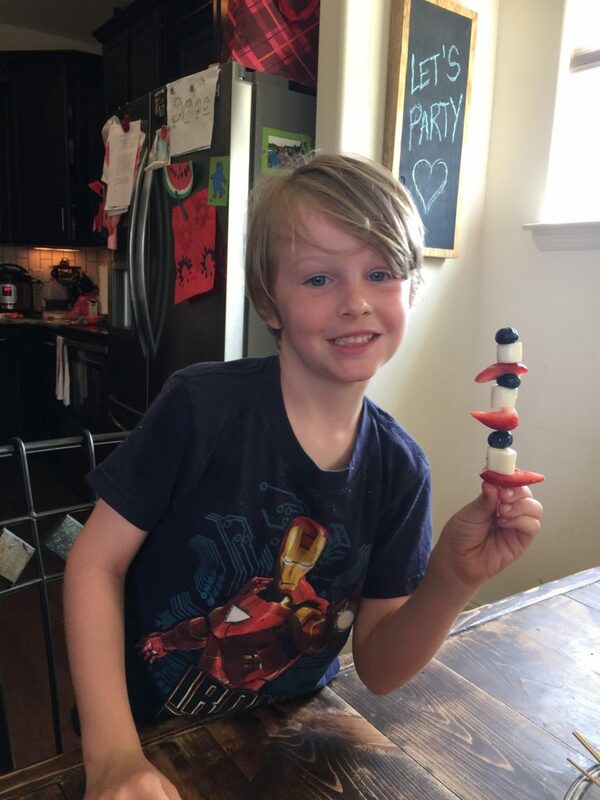 They insisted that we make them at home for the 4th of July holiday. I was thrilled that they willingly ate fruit that wasn’t bananas and apples, so I was all-in. It’s super simple! Your kids can’t eat cheese? No problem. Substitute bananas or mini-marshmallows. In fact, any of this stuff can be substituted with other fruits as long as it can easily hook onto the skewer. Other fruit ideas are watermelon chunks, grapes, or kiwi. 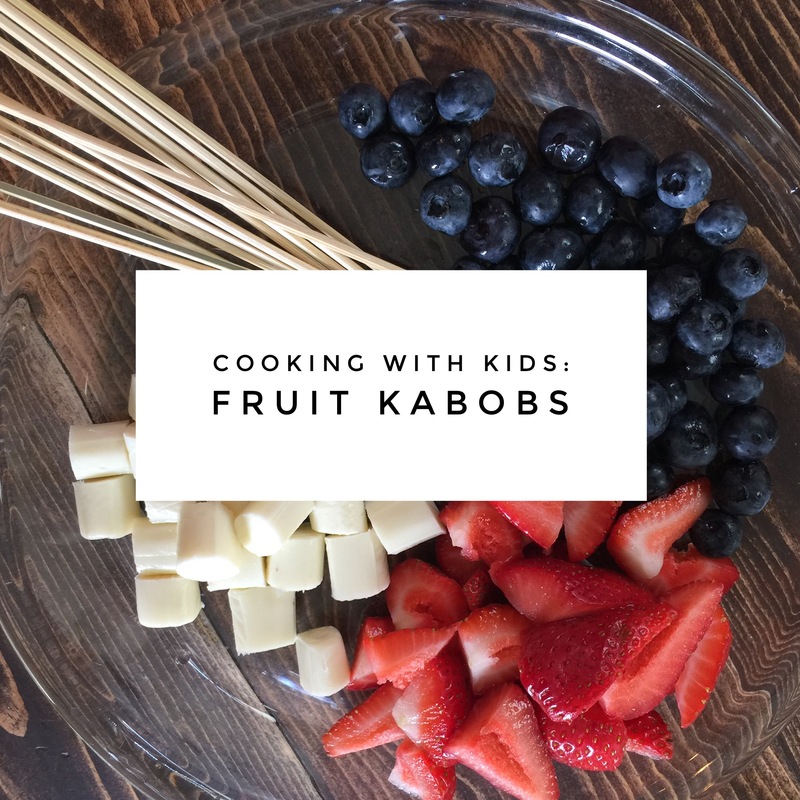 Set all the ingredients out in a dish and let your kids have fun creating the skewers. 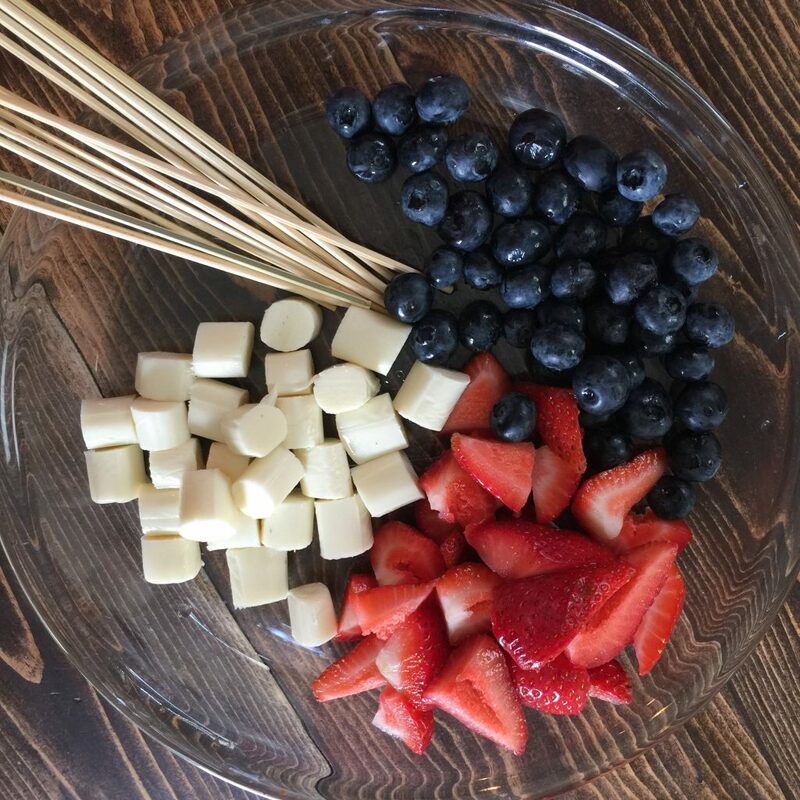 Make it a learning experience by encouraging them to make patterns with the ingredients. Above all, keep it fun and let the kids do their own thing. My three year old put about ten pieces of cheese on his. My control freak self wanted to correct him, but I kept that all inside and let him run the show. If they are having fun, what difference does it make?